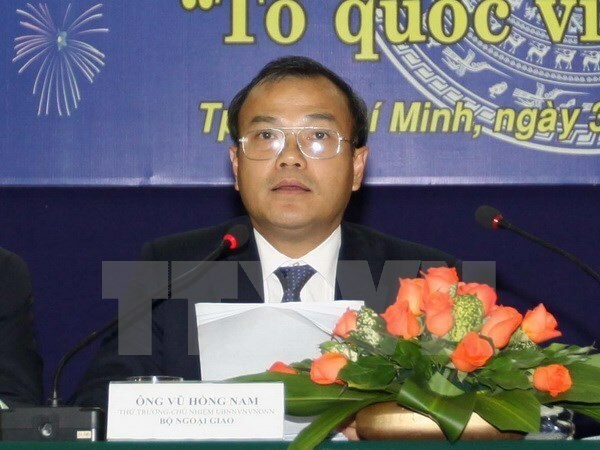 Hanoi (VNA) – Ukraine should tighten security measures to protect Vietnamese expats residing in the Lang Sen area of Odessa , said Deputy Foreign Minister Vu Hong Nam at a meeting with Ukrainian Ambassador to Vietnam Oleksiy Shovkoplias in Hanoi on May 24. The meeting took place concerning Vietnamese residents of the area having had their accommodation searched and their possession taken away on May 23. This was a serious incident, Nam noted. He urged the diplomat to send home a report on the case, requesting relevant agencies to carry out investigations to identify the culprits and motives, as well as to return the confiscated properties of the Vietnamese expatriates. Agreeing with his host, the Ukrainian ambassador said he will send his report immediately and give further information on the handling of the case soon. Previously, after being informed of the incident, Vietnam’s Embassy in Ukraine sent a working group to the site, collecting information and visiting the Vietnamese residents. The group also worked with local agencies to protect the legitimate rights and interest of the Vietnamese community in Ukraine.